These new Solar Tackle Blowback Rig Kit consist of 20 rubber stopper beads and 10 shaped rings which make tying fidly blow back rigs a thing of the past. The Solar stopper beads are simply threaded on the hook shank either side of the shaped ring so that the angler can attach the hair to the ring and adjust the position of the hair with ease. An excellent set up for 'blowback' rigs. 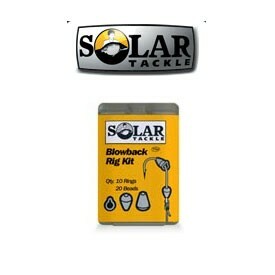 The Solar Tackle Blowback Rig Kit are available in a small size which come in a weedy green or muddy brown colour depending on what type conditions you fish want to fish. Looking to buy some Carp Rigs as part of a fishing gift? If you would like some advice on purchasing Carp Rigs, simply contact our expert fishing team, giving us either an email or phone number on which to contact you and we'll get back to you right away with the best advice and prices. FREE Delivery on all Solar Carp Rigs over £100!! !